I still remember when this song was on the top ten. I was a teenager and it spoke to the angst of the time. Few of us were satisfied in the sixties and the Rolling Stones tapped into that sentiment. There was a whole world to improve and we Baby Boomers were the generation to do it. Now, nearly 50 years later, the song still resonates. But, as salespeople, are we ever supposed to be satisfied? Content? Can’t we ever take time to pause and relax? Top salespeople are rarely satisfied. They believe that when they’ve just made a big sale, that’s the very time to go out and make another. Their adrenaline is pumping, their confidence is up and they’re on top of the world. What better time to go for the next big sale? Are you satisfied? Satisfied with your income, the level of service you provide, or the amount of good you can do for your customer, your community or your family? I think if you are, you start to lose your edge, your curiosity to learn more, your desire to do more and to provide more value to those you serve. Dissatisfaction, like necessity, is the mother of invention. It drives innovation, creativity and hard work. It encourages persistence and the will to pick up the phone again and again in order to reach our goals. It pushes us out of bed in the morning and sustains us in the face of customer objections. Satisfaction isn’t necessarily bad. I can be satisfied with my choice of job, my employer, and my choice of spouse. Dissatisfaction in those areas can lead to problems I’d rather not deal with. But satisfaction in other areas can lead to complacency, smugness and self-righteousness. And in sales, that can lead to laziness, lack of motivation and a lack of drive – the death knell for a salesperson. 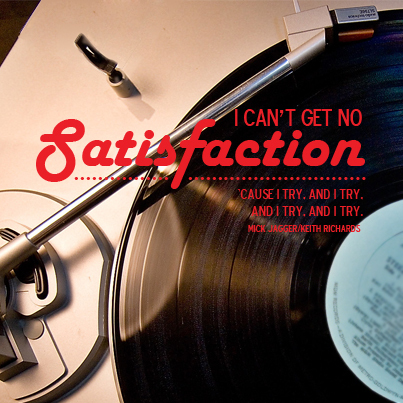 So, if you can’t get no satisfaction, that’s probably good.